The lake city of Udaipur is one of the most popular destinations in the tourist circuit of Rajasthan. During our recent trip to Rajasthan, we landed in Udaipur with only one day to explore its beauty and ethnicity. If you are wondering on how anyone could explore and imbibe the culture and ethnicity of a majestic city like Udaipur, well, we pretty much did it. With proper planning, we were able to explore all the top attractions of Udaipur in one day. 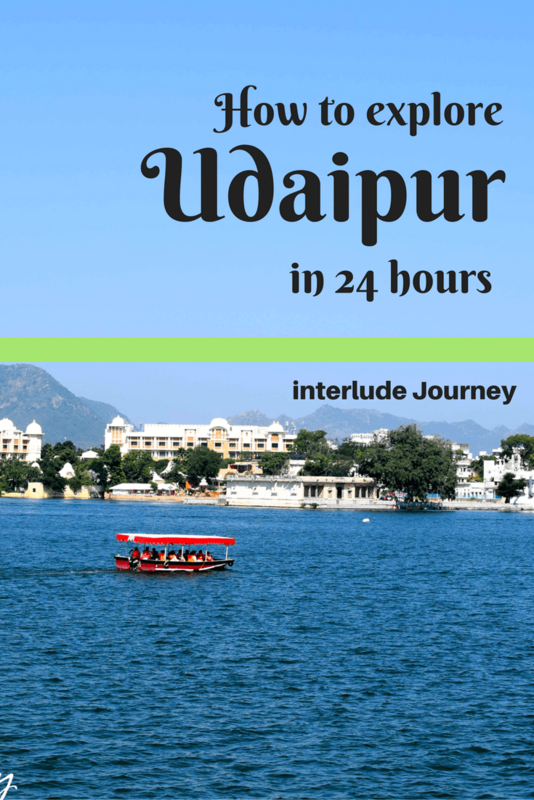 Here is a perfect itinerary for you to explore Udaipur in 24 hours like a pro. This itinerary includes all the major tourist attractions in Udaipur. To visit all the popular attractions of Udaipur at the right time, make sure you arrive in the city the previous day so that you can start the city tour early next morning. Since most of the attractions in Udaipur are located surrounding the Lake Pichola, it is wise to choose your stay close to the lake. Start your day with a walk around Fateh Sagar Lake and enjoy the beautiful vistas as the sun rises from beneath the Aravali mountains. The Fateh Sagar Lake, unlike Lake Pichola, is surrounded by lush greenery and houses 3 major islands which are mostly covered by greens. While the sunset view at Fateh Sagar Lake is more popular with the tourists, enjoy the equally amazing view of sunrise at peace when there is not much crowd near the lake except for the locals who come there for their morning walks. Saheliyon-ki-Bari or the Courtyard of maidens is a beautiful garden located on the banks of Lake Fateh Sagar. It houses many lotus pools, marble pavilions, elephant statues and numerous fountains. It was built by Maharana Sangram Singh and presented to his queen and the 48 maids who accompanied her in her marriage. This garden should not take more than 30 mins to explore. Since you will be visiting it soon after it opens at 9.00 am, there will not be much crowd and you can click good pictures without much hindrance. One of the must visit locations of Udaipur, City Palace is actually a complex of buildings which were constructed over 400 years with contributions from various rulers. It is built on a hilltop on the banks of Lake Pichola and presents a panoramic view of the city and the lakes. The pillars, cupolas, and towers in the palace are embellished with beautiful inlay work of gold, silver, glass, ivory and mirrors. Some of the major attractions you should not miss in the palace complex are the Mor-Chowk ( Peacock courtyard), Dilkush Mahal, Sheesh Mahal( palace of glass and mirrors), Moti Mahal ( palace of pearls), Badi Mahal (the large palace) and the Crystal gallery. You will need 2 to 3 hours to completely cover all the attractions in the palace complex and it is worth every minute you spend there. From the higher buildings in the city palace complex, You can also view the beautiful islands located in Lake Pichola and the famous Oberoi Uday Vilas hotel. This beautiful temple dedicated to lord Vishnu is located very close to the City Palace and is in the old city of Udaipur. Though not very huge, the temple has beautiful carvings on its spires and walls built in the Indo-Aryan style of architecture. The temple is located in the marketplace and is better reached by walk. There are a lot of shops in the vicinity and are good places for bargain shopping. This beautiful mansion located right on the east banks of lake Pichola was built by Amar Chand Badwa who was the prime minister of Mewar. The haveli have has been renovated into a museum depicting Mewari aristocratic culture. The 138 rooms, royal corridors, balconies and courtyards in the haveli house many intricate artifacts belonging to the Rajput clan. While you are at the haveli, make sure you buy the advance ticket for the cultural show held every day at 7.00 pm. The Karni Mata temple is located on a small hill named Machala Hill located on the banks of Lake Pichola. Though the temple is not very popular, the view from the top of the hill is. The best part about a visit to the hill is the cable car ride along the ropeway to the hill. Once on the hill top, you get to see the whole of the Udaipur City including all its major attractions. The view of the illuminated city and its reflection in the lakes after sunset is worth watching. The cable car ride lasts only for 5 mins but there might be a huge queue to buy tickets to the ropeway. It might take around 1.5 hrs to 2 hrs for the round trip. make sure you return by 6.30pm to be present at Bagore Ki Haveli to secure a proper seat for the cultural program. note: If you feel the queue is too long for the cable car ride, skip the Mansapurna temple visit and head towards lake Pichola for a boat ride in the lake. Soon after sunset, the Bagore Ki Haveli transforms into a beautiful stage for cultural and folk performances. The Neem Chowk of the haveli gets illuminated with colorful lights to host one of the best cultural shows in Rajasthan. Seated on the gaddas( mattress) spread over the floor, you can witness many folk dance forms such as Chari, Terah Taal, Gorebandh, Ghoomar, Bhavai and Kalbeli along with puppet show. After a tiring day in Udaipur, head to the rooftop restaurant of Hotel Lake Pichola called UPRE 1559 AD. The restaurant offers one of the best views of Lake Pichola, Gangaur Ghat, Bagore Ki Haveli and the illuminated City Palace. Enjoy lip-smacking Rajasthani delicacies in candle light under the star-studded sky. Udaipur is very well connected with all major cities of Rajasthan by road, trains and airways. Book your stay in a hotel in the old city on the west banks of lake Pichola and choose a room with a lake view. The hotels on the west bank of the lake offer the best view of the various attractions like city palace, Gangaur Ghat, Bagore Ki Haveli, Jagadish Mandir as well as the many islands in the lake. Our suggestion- Hotel Lake Pichola. Most of the attractions are located in the old city of Udaipur where the roads are extremely congested. Hire auto rickshaws for commuting instead of a cab. 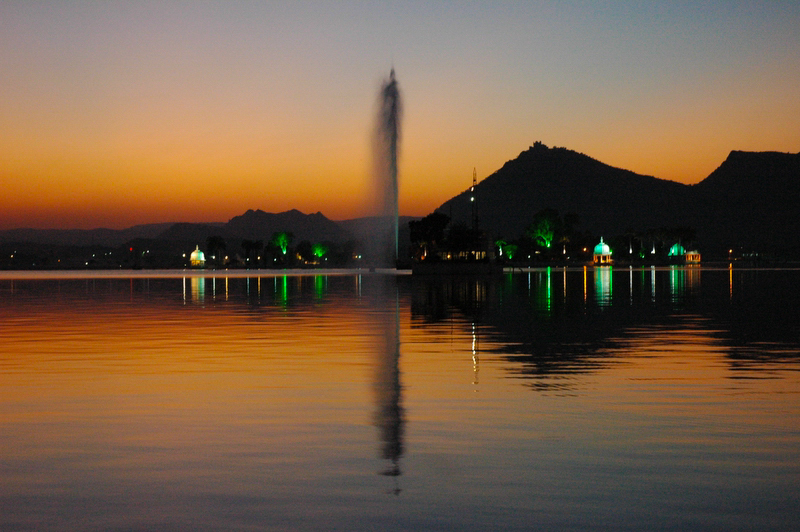 If you do not wish to wake up early to head to Fateh Sagar lake, stay at the hotel to enjoy the sunrise from your room. This is one more reason to choose a room with the lake view. For breakfast and lunch, try Rajasthani delicacies such as dal bhati churma, paranthas with lasooni chutney and ghatte ki khichdi in many food joints located across the city. make sure you are hydrated well by drinking enough water or flavoured buttermilk (locally called chaas). Wear comfortable footwear and carry a scarf to protect yourself from sun or cold. Udaipur provides you ample opportunities for photography. make sure you have enough charge in battery and memory for clicking pictures. The tickets to the cultural show at Bagore ki Haveli are limited. It is good to purchase tickets in advance. Getting instant booking at UPRE 1559 restaurant might be difficult. It is good to make your reservations in advance. However, if you stay at Hotel Lake Pichola, you need not reserve a table in advance. There are a lot of beautiful and historic locations surrounding Udaipur which can be covered on full day trips from Udaipur. Below are two separate day trips you can cover with Udaipur as base. Chittorgarh( around 120 km by road from Udaipur) and Menal ( around 80 Km from Chittorgarh) can be covered in one day. Eklingji temple ( 20 km from Udaipur), Haldi Ghati ( 30 km from Ekling Ji temple), Kumbhalgarh Fort(around 70 km) and Ranakpur Jain Temple( around 50 KM by road) can be covered in one day. If you are visiting Udaipur on a road trip covering other major cities like Jaipur and Jodhpur, it is good to cover the above-mentioned places on the way. Chittorgarh and Menal can be covered while driving from Jaipur to Udaipur. Kumbhalgarh, Ranakpur, and surrounding places can be covered during the journey between Udaipur and Jodhpur. However, make sure you start early so that you will have enough time to cover the places in between and reach your destination city by late evening. That was our short stint at the Lake City of Udaipur. Would you choose to visit all these places when you are in Udaipur? Too good. Very detailed info. Thanks Sindhu. Amazing post I like how you added the times and even the distance. The picture from the dinner looks so dreamy really enjoyed reading your post. Thanks, Nadine. The night view of Udaipur palace and the lake Pichola was our favorite too. I spent almost 48 hours in Udaipur but still couldn’t have enough of it. However, I must say you have made a beautiful and crisp itinerary out here for someone with limited time in Udaipur. It covers all the popular spots. Agree Neha. You can never have enough of Udaipur. We realized we were short on time with only one day to spend at Udaipur. But fortunately, we could cover quite a lot within a day 🙂 Planning to go back some day to cover the places we missed. That was a super itinerary. I am not a big fan of covering places based on time limit but your schedule seems doable. I will be visiting Rajasthan soon. Hey Gokul. We too do not like to rush things up while exploring a destination. Unfortunately, with Udaipur, our plans for the next destination were made and we had to manage with the little time available. But we are glad we could cover much of Udaipur within a day. Wow, Udaipur looks like an incredible place to visit!! Your suggested itinerary covers a lot of great sights, and it’s perfect for people who don’t have much time. Great post, thank you so much for sharing this!! Thanks, Jackie. True that Udaipur is an incredible city. I would suggest spending at least two days to explore the city at leisure. Great summary post of all the things you could fit into 24 hours here. I usually prefer to travel slow and really explore a place…but it’s amazing how much you can see in 24 hours. I love that you have shared the time and distances. The dinner setting looks very romantic. Hey Soraya. Udaipur is a city to be explored at leisure. Unfortunately, we did not have the luxury of time. However, it is definitely to cover most of the important attractions within a day if you can stick to the schedule. Hey Adam. Thanks for dropping by. Though Udaipur can be covered within a day, I would suggest spending at least two days in Udaipur to soak in all that the city has to offer. Hi, Kathy. One can spend more time on top of the hill to enjoy the view of the sunset and city lights. Thanks Milena. We are glad this post will be of help for your trip to India. Fantastic and very informative post. This going to be helpful. I’ve bookmarked for when we get there later next year! Hi Cameron. Glad to know that the post would be of help for your trip to India. Do let us know how you like it after you visit Udaipur. Wow. This looks amazing. I love the historical buildings and the UPRE 1559 looks awesome. Thanks for the great tips at the end too! That is a wonderful article covering some amazing places. I particularly loved some of the photographs which are perfectly snapped. Udaipur is no doubt a beautiful city. Thanks for sharing this. Rajasthan is on my radar. This has been insightful! Exploring 7 places within 24 hours in Udaipur is amazing. it will sure gonna travel the way you did. Great article stating almost every tourist spot. Not only Udaipur but the nearby destinations are also worth to watch. The surroundings are full of rich natural heritage. Wow, what a list. I am going to Udaipur tomorrow and can’t thank you enough for this post.